A Coal Ridge Titan quarterback hands the ball off to another player during an early evening practice at the school. For the third time in three seasons, the Coal Ridge Titans’ football program turns to a new face at head coach, bringing in Paul Downing this summer to help reboot a program that has experienced ups and downs since 2010, winning no more than four games a year. However, last year’s head coach, Bob Frederickson, helped the Titans achieve their best finish in seven years, going 5-4. Frederickson stepped down after the season, forcing the Titans to search for a new head coach. Downing steps in as an experienced head coach, having served as the head man at Highland High School in Ault for two seasons. Unfortunately, Downing steps into a young program that was hit hard by graduation, as 13 senior starters depart, leaving the Titans very young heading into the 2018 season, as just six seniors with varsity experience return. Aside from the six seniors with experience, more than half of the roster is either new to the school, or are freshman. While many on the 40-man roster for the Titans are fresh faces, guys like senior Oscar Salazar, senior Adrian Garcia, senior Brady Sasco, senior Colby Noffsinger, and senior Jan Hernandez give the Titans veteran leadership, on and off the field. Although Coal Ridge returns veteran players at the skill positions, the Titans have to replace four of the five starting offensive linemen, which has caused the Titans to focus on installing the new system throughout the early portion of training camp. As the season inches closer, the Titans know that they face one of the toughest schedules in the state, squaring off with the likes of Basalt, Rifle, Moffat County, Delta, Paonia, Meeker, and Hotckiss, to name a few. 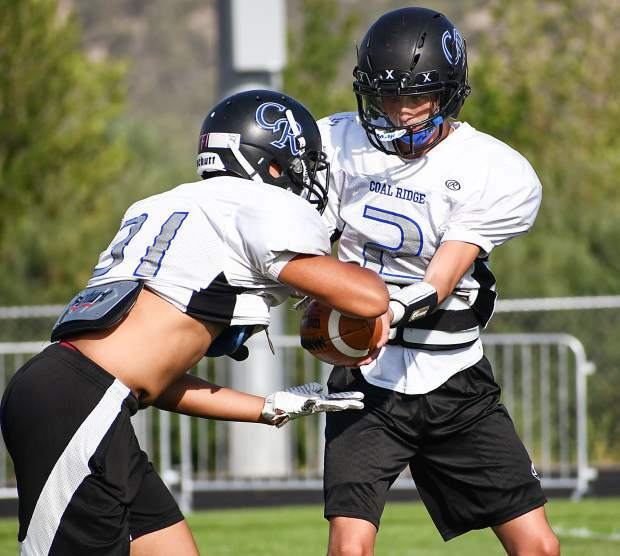 Known last season for its high-powered offense, Coal Ridge should be able to move the football with the amount of talent returning in the backfield and at receiver, but under Downing the defense will need to take a step forward for the Titans to make that next jump in the 2A Western Slope League. With a new coach coming in and installing a new system, culture and expectation level, it’s hard for Downing and the Titans to focus on wins and losses right now. That’s not to say they aren’t concerned with results because you play to win, but in a transition year the Titans are focused on grasping what the new coaching staff is teaching, building a foundation for the program moving forward.